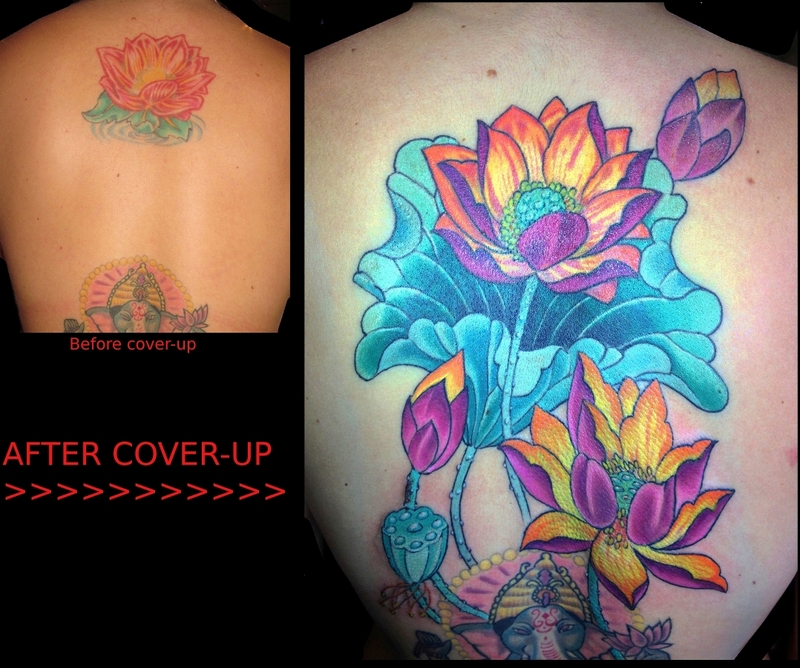 Cover up tattoos, or covering old, poor quality work is a reality for any professional tattooer. Many tattoo collectors learn the hard way that small, impulsive, and un-sound design concepts that seemed like a great idea at the time, turn out to be a serving of regret. 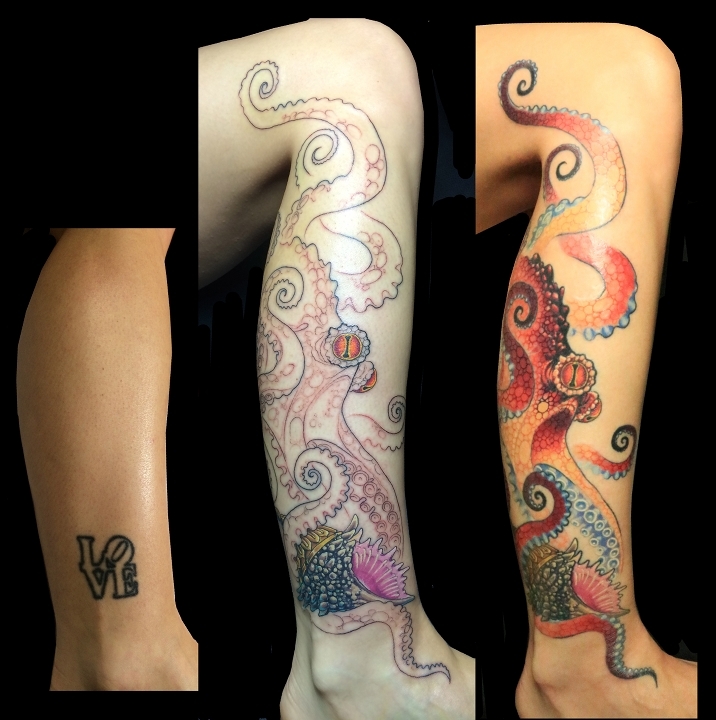 Unfortunately many tattooers don’t really have a very firm grasp on the concept of effective cover up tattoos and make very sophomoric mistakes in their efforts, only to create larger, darker, uglier tattoos that will be even more difficult to cover in turn. This wolf and flower design is a good example of how to think of cover up tattoos. Your new design typically will be quite a bit larger than the old design if you want a tattoo that looks good and isn’t obviously a cover-up. If you have a tattoo you are unhappy with, relax, and take heart. Almost ANY tattoo can be covered successfully. Cover up tattoos do NOT have to be less beautiful than a NON-cover-up, if you move forward as an informed client, and keep these concepts in mind. 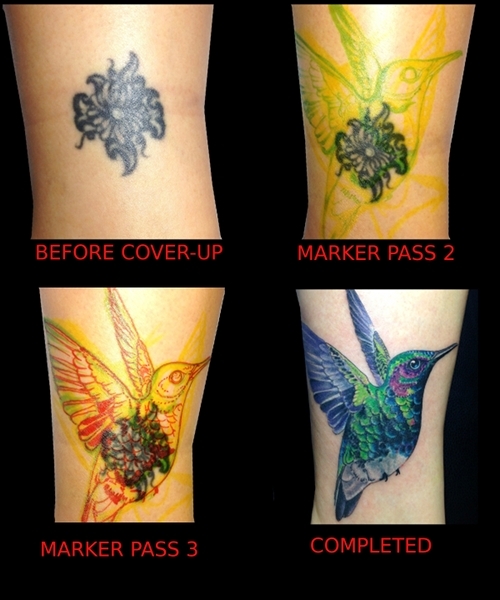 Covering up a tattoo is NOT just a matter of painting a new design over the old one! Cover-ups have to be very cleverly designed in such a way that your old tattoo isn’t going to diminish the new work, by creating awkward dark areas, or by peeking through after its all healed. When the new work is FRESH it may look like it has worked beautifully, but watch out! If the cover-up wasn’t cleverly crafted, the old tattoo will come back through after the new work has healed. 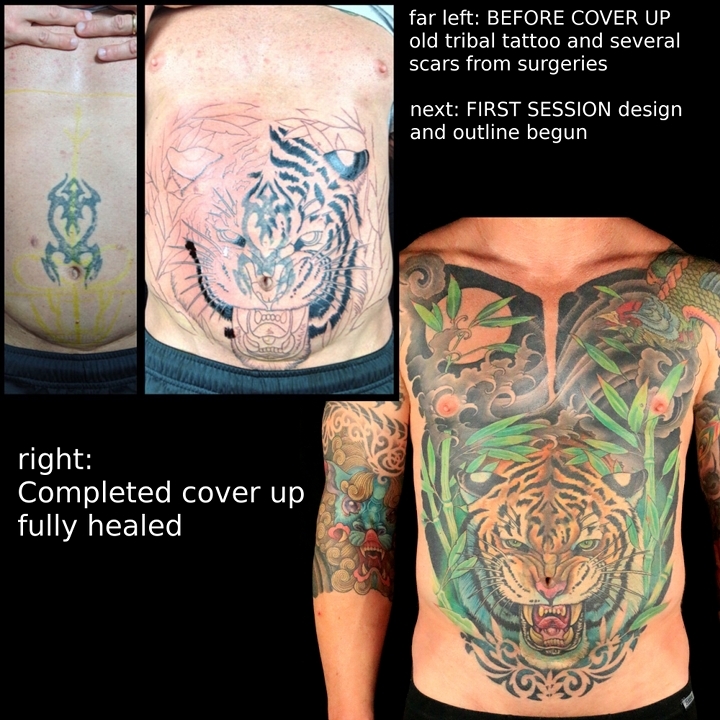 In most cases (excluding the coverage of a VERY small or VERY light tattoo ) the new cover-up tattoo should be much, MUCH larger than the old tattoo for maximum effectiveness. Consider that the area of the new tattoo which is actually covering anything up should be 20% or less of the overall area. 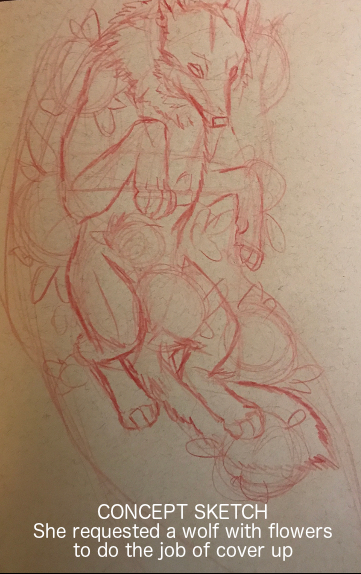 This will enable the old tattoo to be covered with secondary or background elements, instead of trying to use the parts of the new design that SHOULD be clean and perfect to do the dirty work. Know that most cover-ups are difficult not because covering the old tattoo is difficult, but because the client places impractical restrictions on the new work which make the cover-up nearly impossible. 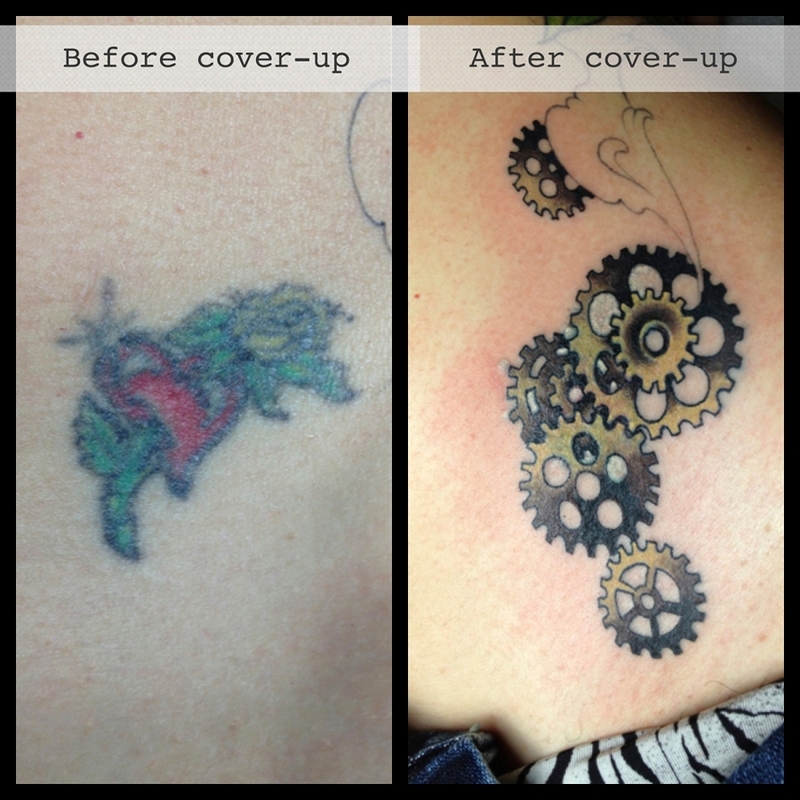 If you want a successful cover-up you need to work with your tattooer and allow them to make an effective design for the job. You wont have the freedom and control over a cover-up that you do with new work on clean skin. Don’t expect that you will be able to get whatever you want, however you want it, in any size that you want it to be. Nearly any concept for a tattoo would be a possible cover-up solution, provided you allow the artist to place it however it needs to be placed, and as large as it needs to be to get the job done. 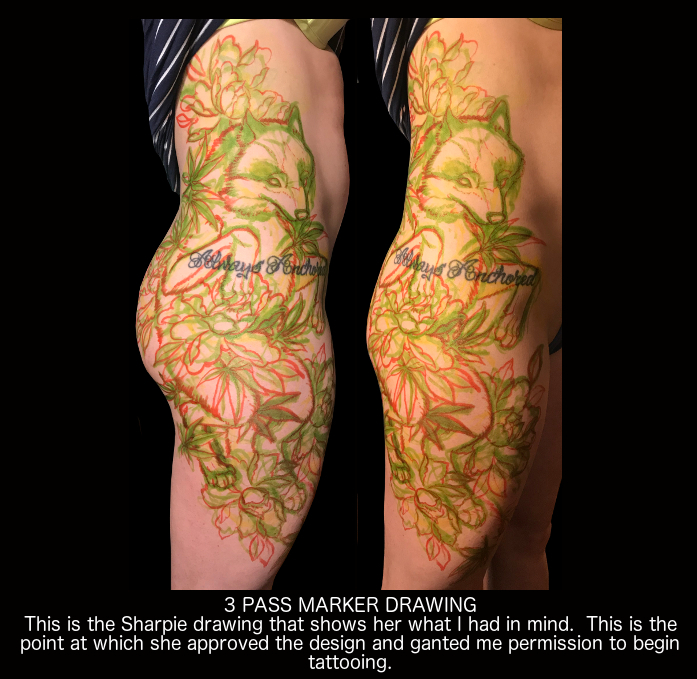 If you have a tattoo you are unhappy with, you are essentially painted into a corner, and only a tattoo artist who is proficient in cover-ups can get you out. Many people who need a cover-up are so gun-shy about tattoos and tattooers (because of a poor prior experience) that they are very reluctant to get another even larger tattoo. This is certainly understandable, however the reality is that you’ll be MUCH happier with a large BEAUTIFUL tattoo, than you will be with a smaller mediocre tattoo. If you get a BAD cover-up, you’re in ten times as much trouble as you were in the first place, because now you need to cover up a cover-up! DOUBLE jeopardy, and now your options are EXTREMELY LIMITED. Don’t make the mistake of assuming that just because your tattooer is good at making tattoos, that they are good at doing cover-ups. Tailoring new designs to hide old ones engages an additional and totally different part of the brain, and is more akin to solving puzzles or cracking code, than to just thinking up nice imagery. Camouflaging old tattoos with new tattoos is a fine art, and it takes a proper understanding of how to lead the viewers eye toward the new work, and not to notice the old. Far too often tattooers will simply black out the old work, and no matter what the new design is you will see a conspicuous blackened area that is not congruent with the rest of the piece. 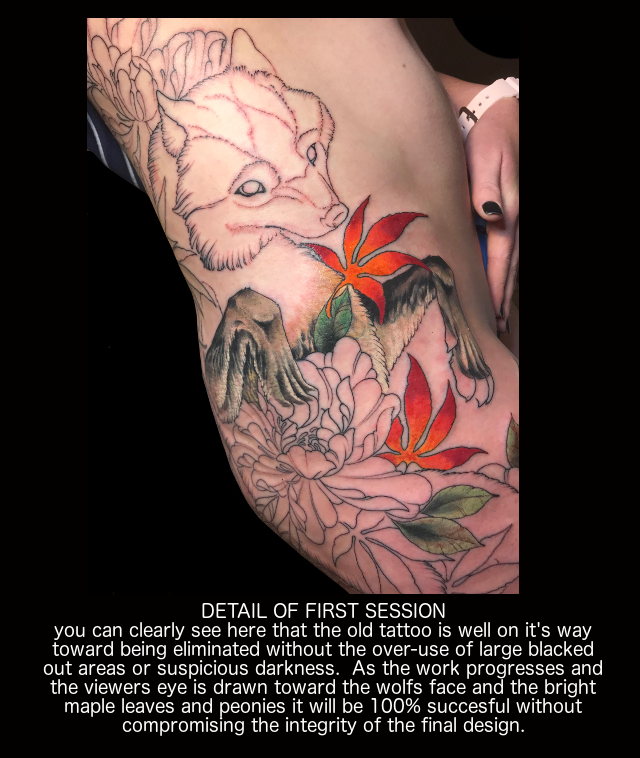 Often tattooers will incorrectly assume they can just ignore the old tattoo and paint over it with any color they like, which is equally incorrect, as the old tattoo will simply re-appear when the new work is healed. Often in successful cover-ups you are better off allowing the old tattoo to peek out here and there in a VERY inconspicuous manner, if need be, rather than over-black it, but these are all very important decisions that only a cover-up expert can make. Many amazingly gifted tattooers are absolutely awful at doing cover-ups. Seek the assistance of someone who can get it right the first time. Here is a look at Austin tattoo shops that do cover-up tattoos.